Officials scramble to determine the cause of the blast, but analysts suspect Al Qaeda-linked Boko Haram. 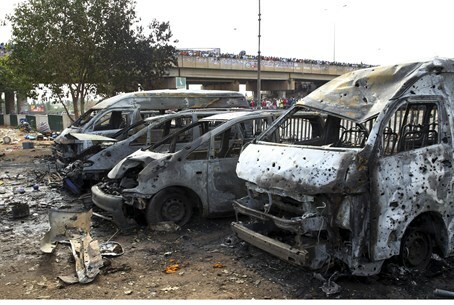 Seventy-one people were killed and 124 injured after an explosion erupted at a Nigeria bus station, official media announced Monday. The explosion, which occurred at the Nyanyan Motor Park on the outskirts of Abuja, erupted at about 6:45 am Monday, said Manzo Ezekiel, spokesman of the country's National Emergency Management Agency. "We're still treating people with injuries and collecting data," said Ishaya Isah Chonoko, zone coordinator for the agency. Officials have not yet confirmed the cause of the blast, but analysts suspect a terror attack - probably from Boko Haram, an Al Qaeda-linked group at the forefront of African jihad. Details on the blast remain scattered, as officials scramble to find an explanation and determine who is responsible for the alleged terror attack. However, witnesses told the British news agency The Daily Mail that the blast left an enormous four-foot hole in the ground - and ignited several secondary explosions as the gas tanks of over 30 vehicles were set ablaze. Boko Haram - which means "Western education is forbidden" in the Hausa language - is opposed to any non-Muslim or western influence in the country, including within its education system. The group is responsible for a huge upswing in violence in the region. The group is a particularly deadly force in Nigeria, reportedly driving the country's security spending up to 1/5 of its annual budget. The New York Times reported that by early 2012, Boko Haram was responsible for over 900 deaths; the Mail & Guardian report brings the current death toll to 1708. BBC also noted in 2011 that not only does Boko Haram kill Christians, other "infidels", and police; they also have been known to kill Muslim clerics who disagree with the group or its policies - as well as massacre innocent schoolchildren. Boko Haram's offensive in the global terror war has made headlines recently, after reports surfaced that the group was taking Christian women captive as slaves. In February, the group murdered 59 boarding school students in an early-morning shooting and arson attack. Later Monday, Nigerian President Goodluck Jonathan cancelled a trip to Ibadan over the blast, according to local TV station Channels, and visited the blast site. “We have lost quite a number," he said. "We condole with our country, men and women. The issue of Boko Haram makes for quite an ugly history within this period of our own development." "The government is doing everything to make sure that we move our country forward," he continued. "But these are the unnecessary distractions that are pushing us backward. But we will get over it."